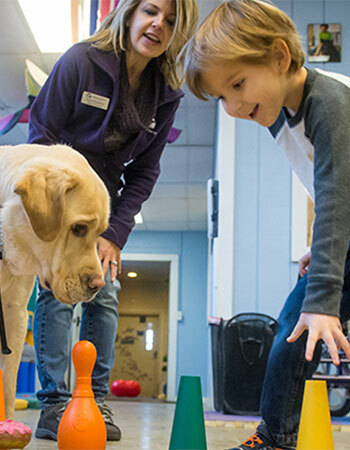 To ensure the proper follow-up services are provided to recipients, the foundation made a donation to Canine Companions for Independence facility teams who work with children with disabilities in schools across the region. The grant will assist Canine Companions by providing services to graduate teams like Patricia Lenzo and Facility Dog Gino, who work at the special needs school in Chatham, New Jersey. Patricia was placed with Gino in May 2011 and works as a canine educator, helping students with disabilities in academic, physical, motivational, and behavioral environments. Founded in 1975, Canine Companions for Independence is a non-profit organization that enhances the lives of people with disabilities by providing highly trained assistance dogs and ongoing support to ensure quality partnerships. Headquartered in Santa Rosa, California, Canine Companions is the largest non-profit provider of assistance dogs and is recognized worldwide for the excellence of its dogs, and the quality and longevity of the matches it makes between dogs and people. The result is a life full of increased independence and loving companionship.